The Honeywell DH150 Dehumidifier provides an integrated solution to controlling humidity for the owners of larger homes. With a massive 150 pints per day water extraction capacity this unit will keep a large home comfortable and free from moisture damage. If you have an exceptionally large crawl space, basement or attic this energy efficient unit can be operated in free standing mode to keep it secure from excessive humidity. The Honeywell DH150 Dehumidifier is an exceptionally energy efficient unit. With an energy factor of 3.74 litres of water per kilowatt hour this Energy Star dehumidifier is streets ahead of most of its competition. Room dehumidifiers struggle to achieve even half this level of efficiency and cannot compete with this frugal machine. As if this was not enough because it lowers relative humidity it reduces the "experience" of warmth at any given temperature. High relative humidity reduces the amount of water (sweat) which evaporates from the skin making any given temperature feel two or three degrees higher than it would at a lower level of humidity. This means that when the humidity is lowered the air-conditioning can be set two or three degrees higher for the same degree of comfort which allows significant savings on energy costs. The Honeywell DH150 Dehumidifier is powerful; powerful enough to dehumidify a house of up to 3,600 sq ft yet it comes as a very compact package. Because it works through existing HVAC ducting to reach the whole house it can be tucked away neatly out of sight, perhaps in the basement or crawl space. Its tidy design makes it suitable for tight spaces to ensure that the most convenient and unobtrusive location can be used. If you happen to have a monster basement, crawl space or attic that needs a machine of this capacity the DH150 can also run as a free-standing unit within that area. Because the natural habitat of the Honeywell DH150 Dehumidifier is the lower depths of the home, which tend to be cool, it is designed for low temperature operation. When room dehumidifiers are performing at their worst this unit gets into its stride and performs effectively and reliably. The relative humidity of the house is regulated by the humidistat incorporated in the unit. Operating like a thermostat this device monitors relative humidity and cycles the machine on and off to maintain your preferred setting. This too contributes to energy efficiency as the Honeywell DH150 does not run constantly. What is constant, however is the level of relative humidity, ensuring the comfort of occupants of the home, preserving the structure and contents of the house from moisture, mold and dust mites and offering protection to sensitive items, such as a piano, which need a stable level of relative humidity. The dehumidifier can also contribute to improved ventilation throughout the home, a feature which can be enhanced with the optional extras available. It also incorporates a MERV 11 filter which captures a large proportion of airborne particles, including many mold spores. 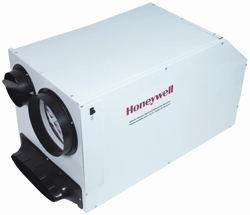 The Honeywell DH150 Dehumidifier is also equipped for continuous drainage. This feature allows the condensate to be drained away to a convenient outlet as it is collected, relieving the chore of emptying buckets that is a disadvantage of room dehumidifiers. It goes without saying that this dehumidifier will cost considerably more than an off-the-shelf, X or Y brand room dehumidifier. On the other side of the scales most homes this size would need more than one room dehumidifier, using twice as much energy per pint, needing to be replaced in ? months/years. This unit comes with a five year warranty, which speaks for itself, and offers, we believe, excellent value for money.